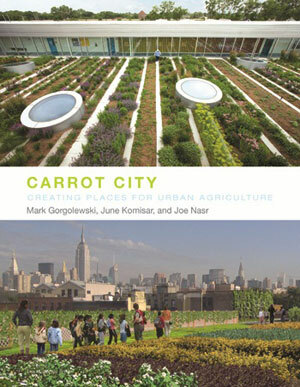 Carrot City: Creating Places for Urban Agriculture, written by Ryerson University professors Mark Gorgolewski, June Komisar, and Joe Nasr explores the new era of urban agriculture. A flux of design proposals has emerged over the last few years that respond to the increasing interest in food security and sustainability. While cities have historically provided productive spaces for growing food out of necessity, the proposals in Carrot City represent an effort to think more coherently and strategically about food production. They show how urban agriculture can become infrastructure for re-integrating food production into the urban fabric in meaningful ways, eventually becoming, as the authors argue, as imperative to a city’s functioning as public sanitation systems. The book presents nearly fifty case studies that examine food production, processing, distribution, and marketing. These proposals, some visionary and others built or underway, explore how food production works — from the small components for growing, like raised beds and greenhouses, to city-scale systems of urban agriculture. The book came out of a symposium held at Ryerson University in Toronto, Canada, in May 2008 that was followed by a traveling exhibition begun in Toronto in early 2009. The three authors of the book are all on the design school faculty at Ryerson, each interested in food systems and the impact of urban agriculture on building design and the built environment. Many of the case studies presented are based in Canada and the U.S., as well as a few in the Netherlands, the U.K., and Argentina. They demonstrate the success of a growing movement of smaller, community-based initiatives generating productive food spaces throughout cities such as Toronto and New York where local governments are increasing support for these efforts. Concern over how to feed a growing urban population in cities where many neighborhoods are becoming food deserts has put urban agriculture on the political agenda. There is also increasing recognition that dependence on agribusiness and commercial food systems has caused extensive damage to the environment while producing food with low nutritional quality that requires high energy consumption to transport long distances. Urban agriculture is consequently now part of the larger conversation about climate change, pollution, food, energy security, and health issues such as obesity. A majority of the case studies show how urban agriculture can help alleviate environmental impact and provide food security while bolstering communities with venues for social interaction and education. Small city farms, community gardens, and edible schoolyards and campuses provide healthy food for residents as well as opportunities for them to interact in meaningful ways. These gardens can “activate” a variety of urban spaces, making productive use of otherwise abandoned lots, former industrial sites, and empty rooftops. They can even be mobile, as the Science Barge in Yonkers, NY, demonstrates. The 400-square-foot barge on the Hudson River relies entirely on renewable energy for food production. Solar panels, wind turbines, and biofuels generate the energy needed to power the barge. Food is produced without chemicals in hydroponic systems and greenhouses irrigated with collected rainwater and purified river water, reducing land and water use. Other case studies demonstrate that outlying areas in suburban and peri-urban neighborhoods can also provide spaces for food production. Advocates for rethinking the residential landscape, like Los Angeles-based designer Fritz Haeg, want to increase awareness about the viability of producing food in residential spaces. Over the past several years through his Edible Estates project, Haeg has developed regional prototypes for productive gardens and installing them on suburban lawns in U.S. cites like Baltimore, Austin, and Kansas City, as well as in London, Rome, and Istanbul. The gardens are living examples of how suburban lawns can be transformed into attractive and productive spaces that improve the residents’ quality of life and help combat issues related to commercial food production. As innovative and inspiring as these small-scale case studies are, the book’s larger message is that there is potential to fold these smaller initiatives into a broader design agenda focused on developing higher density, multi-functional, and well-integrated communities that address food security issues as well as broader issues of sustainability. Evidence has shown that spaces for food production can eventually be connected to form larger networks of integrated systems. With a coordinated strategy rooted in analyses of the urban patterns that influence how and where urban residents produce, acquire, and consume food, designers can work with communities and city governments to establish new networks. Based on closed-loop, zero waste, and energy-efficient systems that support food production, designers can connect communities across the urban fabric, using otherwise vacant spaces in meaningful ways to combat social and environmental problems. These Continuous Productive Urban Landscapes (CPULs) take advantage of waste spaces: gaps in the urban fabric that isolate communities, such as abandoned, underused, or overlooked land parcels like riverbanks, rail corridors, former industrial zones, and even residential plots sitting idle. Consider, for example, Ravine City, a city-scale proposal to use Toronto’s natural ravine system to connect the sprawling city to the natural infrastructure of its continuous watersheds. By daylighting certain ravines and connecting them to existing ravines, a series of green corridors could run through the heart of the city supporting a system of collective housing and productive gardens. An infrastructure of energy, water, and waste systems would support this structure. All of the buildings would have overlapping functions, generating solar power and wind energy, producing food on roofs and terraces, treating wastewater, and collecting stormwater. They would also provide recreational space. Additional food production and recreational activity would occur on open land. Ravine City and similar proposals may sound idyllic to the point of seeming impossible to actually achieve, but the authors of Carrot City have reason to believe that the climate is right for making such dreams a reality. Pressing environmental concerns will continue to push cities to adopt more sustainable patterns of living to address issues like food security. The case studies demonstrate that urban agriculture can be used to establish such patterns, and that there is already considerable energy behind efforts to do so. This guest post is by Shannon Leahy, Masters of Landscape Architecture candidate, University of Pennsylvania. Thanks for the heads up, I’m going to have to go hunt this book down.